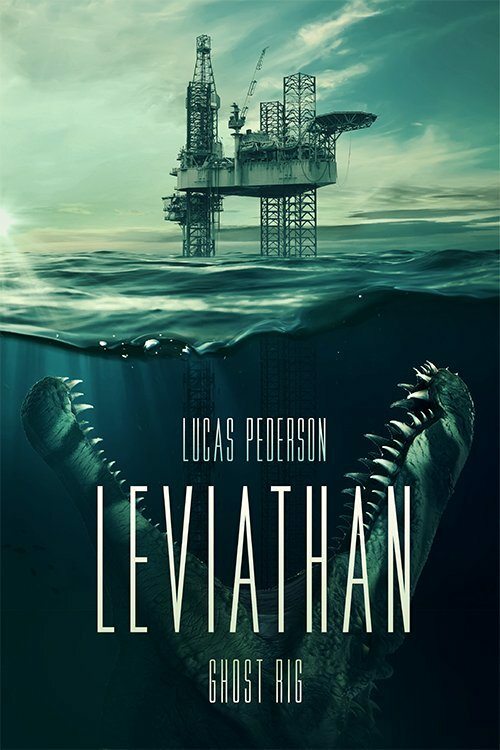 Lucas Pederson’s Leviathan: Ghost Rig is a solid entry in the marine-creature subgenre, a novel that exploits the mysterious and terrifying vastness of the ocean while telling a tale of human duplicity and greed, countered by courage and loyalty. Given the title (and the eye-catching cover), readers will legitimately expect Bracken to run afoul of a dagger-fanged leviathan, and they will not be disappointed. Here Pederson is at his best, building on the earlier appearance of a man-made chimera to create not one but two creatures against which Bracken and his crew must struggle…or die. Following the lead of John W. Campbell in “Who Goes There?” as interpreted visually in the various film versions of The Thing, both are proteans, monsters composed of elements of their victims; one of them is capable of changing its form completely to mimic the dead and thereby trap additional prey. Once the creatures are identified, Bracken’s task shifts from resurrecting the ghost rig to surviving, minute by minute. What follows are episodes of carefully modulated tension interspersed with abrupt moments of startlement designed—successfully—to elicit a quick intake of breath and a frisson along the spine. Level by level, piece by piece, the ghost rig delivers up its secrets and claims its victims. I have two minor quibbles with Leviathan: Ghost Rig. The first relates to the ghost rig’s name Seraphim, often abbreviated to Sera. One of the younger members of Bracken’s crew is Cera; the appearance of the two names, so close in spelling and apparently identical in pronunciation, opens the possibility of confusion, especially earlier in the story. The second is in some senses extra-textual. After so carefully and exactingly detailing the crew’s struggles against betrayal, isolation, and unimaginable horrors, the novel seems to rush to an abrupt ending. The final chapter glosses over the crucial aftermath of the final battle against the leviathan, summarizing what could otherwise have extended suspense and ultimately created a winding-down of adrenaline that is here simply asserted. And the epilogue, “Out of the Fathoms,” similarly asserts a conventional happy ending that ignores a number of unresolved questions and, more critically, promises that Bracken had made to himself and his crew. Essentially, Pederson did such a fine job that the reader—that is, I—wants more.